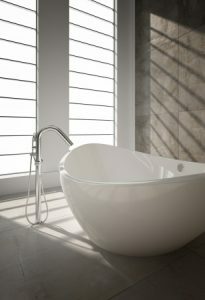 A typical issue with your bathtub and shower is a clogged and slow-moving drain. These may not seem more than a minor inconvenience, but a clog can cause stress on the pipeline, which can lead to cracks and leaks. Depending on how bad the blockage is, there are several ways we can get the issue taken care of. After inspecting the drain line, we will decide whether it is best to use chemicals, snake the pipeline or use hydro jetting to clear out the debris. Low water pressure could be a sign of a potential leak or problem in the shower head. Having an inspection done will eliminate these concerns and discourage the problem from spreading. Updated on June 15, 2016 at 3:26 pm by Sunset West Plumbing & Rooter.